TAMANNAAH TO PLAY A 60 YEAR OLD LADY? STR's Anbanavan Asaradhavan Adangadhavan is progressing at a brisk pace with Tamannaah joining the second schedule today (15th October) with STR. 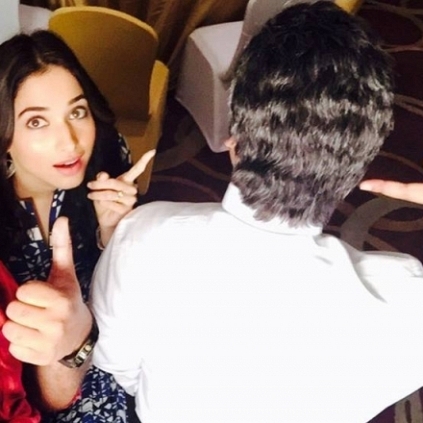 The VTV actor will be seen playing Ashwin Thatha in this schedule, while the role of Tamannaah is not yet revealed. Will she also be sporting an old lady getup to pair up with Ashwin Thatha, or will she be playing her age? Well, we will have to wait for an official announcement regarding this. AAA stands for Anbanavan Asaradhavan Adangadhavan as we all know. Going by the first teaser, it looks like Madura Michael will be the 'Adangadhavan' in the film. We always believe that elderly people are experienced who do no get easily influenced by anything. So, will Ashwin Thatha be the 'Asaradhavan'? Who is Anbanavan then? Wait for the team to reveal the third and final character of the film which is expected to be out soon. People looking for online information on Anbanavan Asaradhavan Adangadhavan, Simbu, Tamannaah will find this news story useful.